During her sixty-three-year reign, Queen Victoria gathered around herself a household dedicated to her service. For some, royal employment was the defining experience of their lives; for others it came as an unwelcome duty or as a prelude to greater things. Serving Victoria follows the lives of six members of her household, from the governess to the royal children, from her maid of ?honor to her chaplain and her personal physician.Drawing on their letters and diaries—many hitherto unpublished—Serving Victoria offers a unique insight into the Victorian court, with all its frustrations and absurdities, as well as the Queen herself, sitting squarely at its center. Seen through the eyes of her household as she traveled among Windsor, Osborne, and Balmoral, and to the French and Belgian courts, Victoria emerges as more vulnerable, more emotional, more selfish, more comical, than the austere figure depicted in her famous portraits. We see a woman who was prone to fits of giggles, who wept easily and often, who gobbled her food and shrank from confrontation but insisted on controlling the lives of those around her. 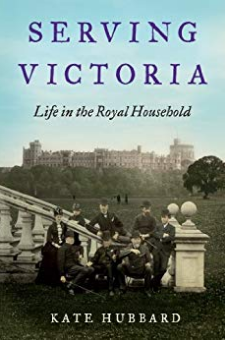 We witness her extraordinary and debilitating grief at the death of her husband, Albert, and her sympathy toward the tragedies that afflicted her household.Witty, astute, and moving, Serving Victoria is a perfect foil to the pomp and circumstance—and prudery and conservatism—associated with Victoria's reign, and gives an unforgettable glimpse of what it meant to serve the Queen.